"Hey Dad, lets build this school!" Zhen is attending a Montessori school which places the priority on self-led education. The goal of this style education being to develop self-reliant learners that are empowered by the learning process rather than the material mandated for successful digestion and regurgitation as documented in testing results. As a parent with plenty of educational experience to draw from, I am thrilled to provide my child with this structure for his academic world. I believe in the power of self-education as well as the power of community-driven learning, and am a big proponent of the open-source software development ecosystem as a result. Some of the most inspirational and exceptional learning results have been achieved in this environment in my opinion, and should be modeled by all institutions seeking to improve how they measure success at learning by doing. In this vein, I have been tinkering with the idea of offering some weekend and summer learning opportunities to 4-8 year olds that are definable as entrepreneurial in nature. I define entrepreneurship as "the act of creating value while starting with little to no beginning resources". In this way, entrepreneurship is not merely a business activity, it is a creative act. The fact that we socialize our creative works within our socio-economic model of capitalism does not change the original impetus of the entrepreneur; to be creative and exercise that creativity in valuable ways. Whether in science, medicine, farming, biomimicry, technology, parenting, writing, sculpting, athletics, construction, or mathematics... entrepreneurs exist to create outcomes, both good and bad, to learn from their efforts, to reformat those efforts and toil until they are satisfied that their intentions have been adequately manifested/tested/disposed of in the world. It is the work of heroes! Zhenerbee started orientation for school this week, but was home everyday by 12:00. So it was activity week for Dad. I wanted to take advantage of the beginning of the learning process with some advanced instruction. Our 4 year old has much expected of him. So we learned about solar energy this week. 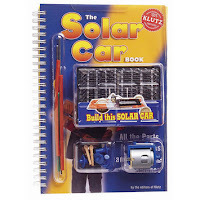 The Klutz Solar Car Kit is an easy way to initiate the process of learning about energy from the sun, and the process by which we use it to manufacture outcomes of some utility. After finishing with the solar car and having some fun racing it around on our new deck, we received another learning activity in the mail the next day. A 6-in-1 Solar Powered Transformer Kit. Zhenerbee had eyes the size of half dollars! Great surprise! And so we immediately went to work creating our solar powered robot dog. Next up, an airplane run by the sun. School starts on Monday and we are off the the races! We will be building flying helicopter hospitals to fix robots and people in no time, that being the stated career path of our farmer as of now. Don't worry chix, he'll still come for your eggs. Sid the Science Kid is interesting to our four year old farmer, Zhenerbee. We like science, and since we have turned off the satellite TV service in favor of free over-the-air digital signals, we have been finding a lot of time to explore it. Lo and behold, our limited TV options still manage to yield Sid. Yeah public TV! So we mentioned Sid to Mom. Watch out world! Sid just might get invited to dinner now. Mom is an exceptional cook. She whips up some real doozies in her kitchen. Our farmer likes to eat what Mom is cooking up! Check Him Out on PBS!